Here's a cartoon that was in The Spectator last week and makes a re-appearance this week in the media digest magazine The Week. I tend to find that, broadly speaking, my cartoons fall into two categories: there are the ones that are based on observations of life, they're usually topical (in the sense that they are about the times we live in, rather than about this week's news) and, at the risk of sounding a little pretentious, there's a kind of "truth" to them. Then there are the ones that are just a bit silly, a throwaway line, sometimes a pun, a play on words, or a visual pun. 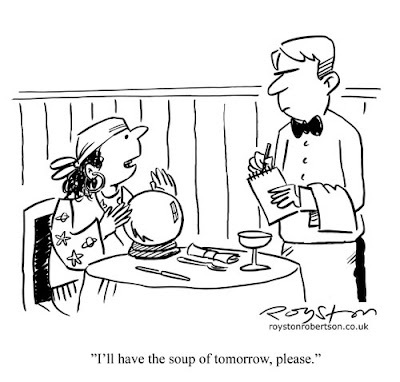 "Soup of tomorrow" falls into the latter category! 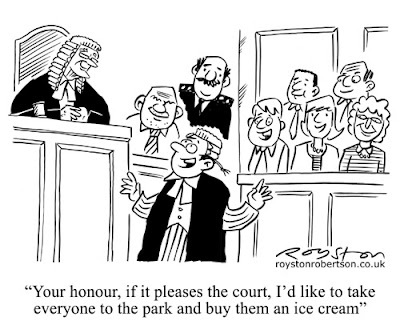 I suppose, on balance, I find it more rewarding when I come up with cartoons in the first category. But I try not to take myself too seriously (a good idea if you're a cartoonist!) so it's always fun to do the "boom-boom" gags too. I prefer your 'boom, boom' jokes, Royston. Please note new blog address to link to. I'll add yours now. Ha, that's fair enough. I'll make sure I keep doing both! It's amazing how often magazines such as The Spectator do go for the silly stuff, despite (or maybe because of) their veneer of seriousness. 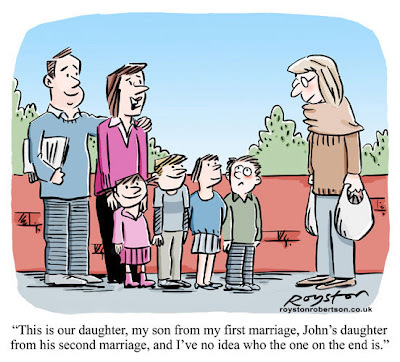 Submitting cartoons: Watch that punctuation! Easter cartoon: Is it that time already?